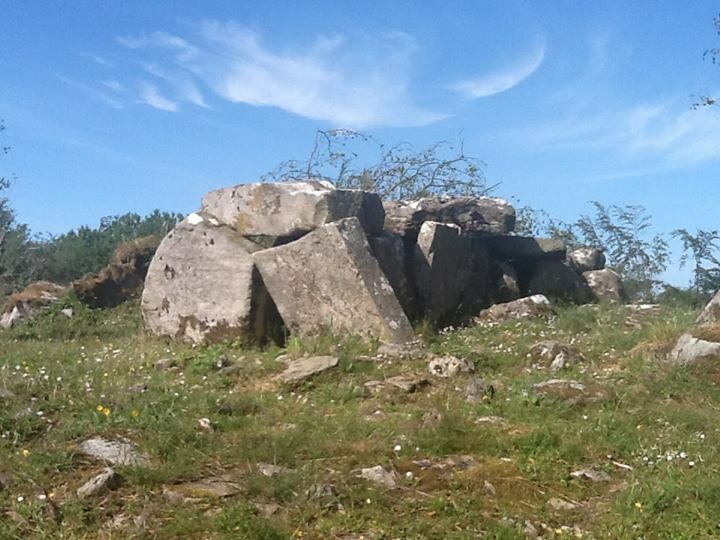 Where's The Fae in Cavan's Burren? When our Bards In The Woods is at Cavan's Burren, it confuses some people as most people know of the Clare's Burren landscape and think that is it. 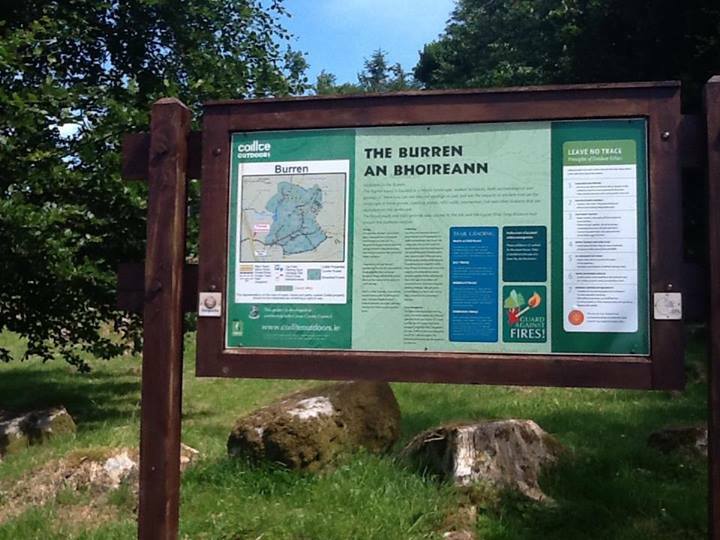 There are Burrens all over Ireland, Bhoireann, Bórean, Boreen, Rocky Place (in limestone). This one, like all of them once did, has trees and soil on it still, though it is largely a Coillte plantation and a lot of it recently clearfelled. Among the plantations, and now many exposed through clear felling, are several very ancient megalithic stone age, bronze age, iron age and early monastic age ruins of dolmens, cairns, boulder burials, kerb stone circles of ancient settlements along with very interesting ancient ice age debris. I arrived about five minutes to three, first to be here, sunny, a bit cooler than the recent heatwave days plus a lovely breeze. This was a 100% perfect woodland weather day. 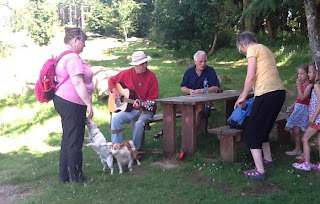 I received a call from an Eimear Crowe of Cavan Community Radio who wanted to walk with us and record some bards in action. I gave her directions to find us and she arrived within a few minutes. By that time, Bee Smith and Tony Cuckson and their two delightful dogs turned up, and Sean was hiking the path towards us. 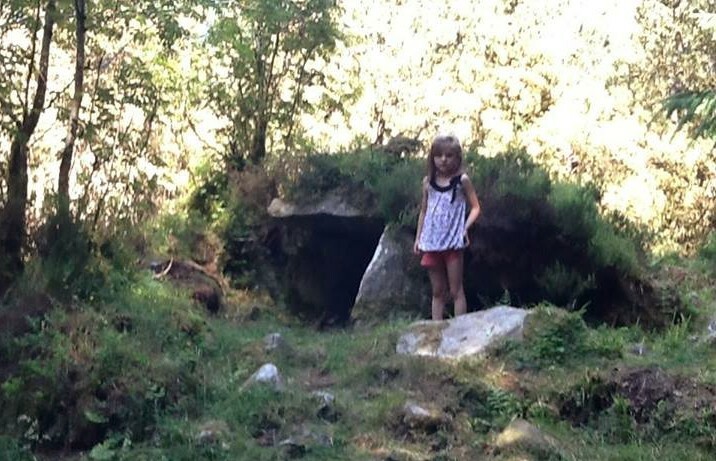 Eimear had two daughters with her ready to explore. Bee said more people are likely to turn up, but just before 3:30, after waitng nearly 30 mins, we went on our trek. 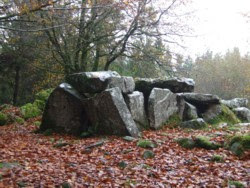 First stop was what I think is all of our favourites, the Cairn Dolmen. ... and, as usual, curious about some volcanic erratics on the way there. As there was a rowan here, now growing well, and out link with this megalith and its other world, I broke into Luis The Rowan. As that finished, for some reason all of the women and girls scarpered back down the path we had come from. Tony, Sean and me hung on for awhile thinking they would return to go along the path to the Druid chair ... but they did not return. Tony went to investigate to see where they were, and soon saw himself in the distance taking another path to the Druid's Chair that is longer but perhaps easier. We assumed the women had gone that way too so Sean and I went the 'low road' as we wanted to try and get some pics of the many ancient sites along that path. 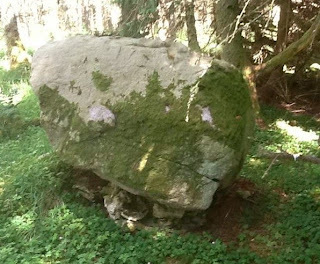 After awhile we thought we heard voices, so took a detour on another path that headed to the Rocking Stone. There was Tony singing a song, which I also have a vid of going up on You Tube soon. Apparently the women did not follow him. Tony walked with us awhile towards the Druid Seat, but decided to double back and meet up with the women. ... we met two lads from Cavan who had arrived late and had been looking for us. 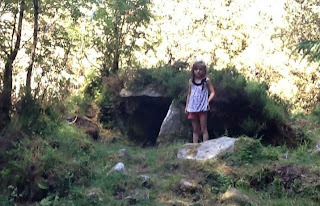 They thought we were going to picnic at an ancient site called the Calfing Dolmen there and had stashed their picnic stuff there. At that time I was eager to finish our walk and picnic anyway and invited them to walk with us. However, their curiosity was to go where we had been to see more. 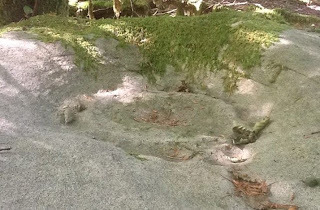 and Lightning Stone ... that I did not get a good pic of, There is a terrific photo of that by Mike Bunn somewhere ??? 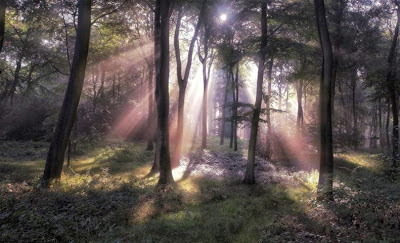 Get to a Mike Bunn exhibition if you even can to see how he interpets this forest. We headed towards the big Giant's Leap Dolmen which I still find strange sat there exposed after all of the trees around it has been clear felled. Archaeologists are delighted with this as they can talk endlessly about alignments now and many other ancient sites come into view on hilltops. To me, it just did not feel right. For one I miss all of the beech trees that were once around here. A few young ones still remain but give no cover. So now the intent was to get back to the picnic table to perhaps join others there for a craic. 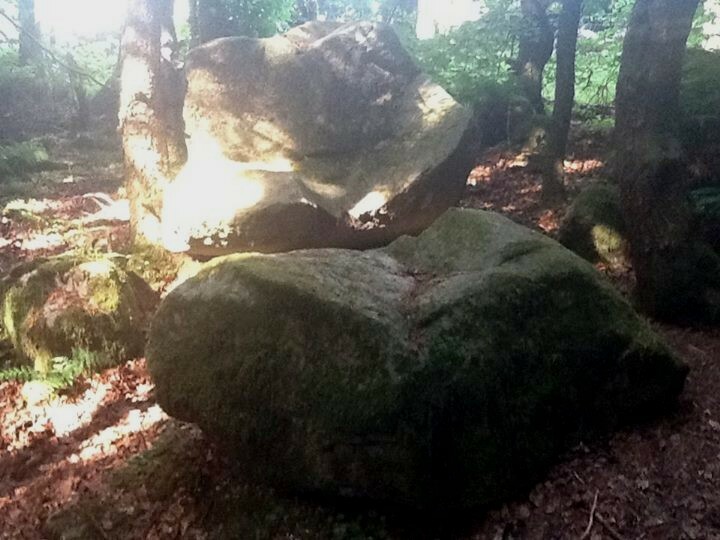 The two lads we met by the Druid's Seat re-appeared to grab their stash to rejoin others. 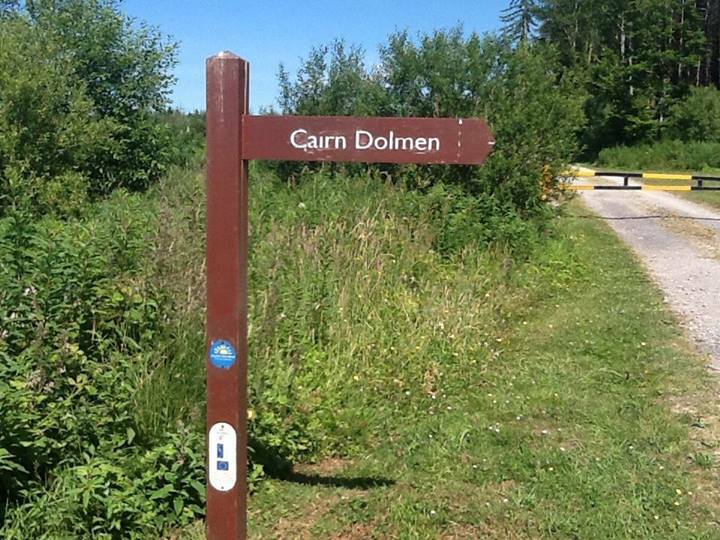 We suggested walking back together, but then two more men and one woman from Cavan appeared who had been looking for us. I talked awhile with them and they decided they would explore more sites before joining us at the picnic table. I then strolled forth to join the others but, alas, by the time I was at the picnic table most of the people had gone, and the rest decided it was time to go home as they were not very hungry. So it was picnic for one for me this time ... but then 3 more people from Cavan turned up saying they had been looking for us, but had come on later at 5 pm as they went to a beach first. I invited them to stay for picnic, but they had also been around many sites and it was now, 6:45 pm, too late for picnic they said, they wanted a bar food meal ... and off they went. . 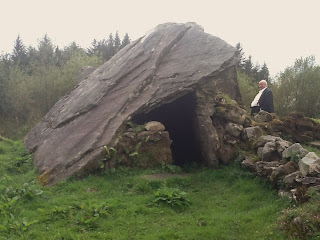 Overall, I was impressed that several people from Cavan town had come along, as its quite a trek for them to get to The Burren in the west of the county. 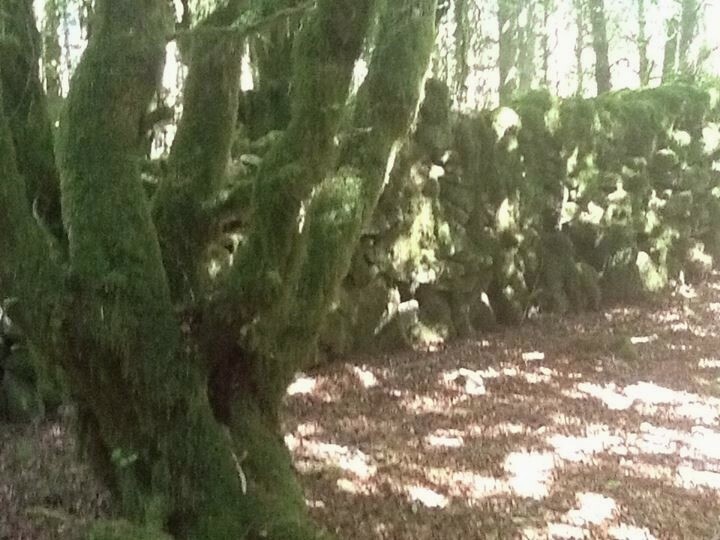 I am surprised no Co. Leitrim people were there as this forest is quite handy for Manorhamilton and Drumshambo people. The evening was as beautiful as when I arrived, with the sun, golden shadows, temperature just right and a very caressing warm breeze. With nobody else left present in the vast forest I could imagine a romantic couple having a lot of freedom with their romance here ... especially as today there were very few irritating insects about. The wind moved them on. Time to leave, I'll be back next year. Each time I return here something has been done to improve public access and attention to Cavan's Burren. I am not quite sure what has been done in the last year. There seems to have been a bit of lawn mowing and manicuring in parts, spots that I remembered as muddy dips are now flat grasslands. The signage has gone through several changes over the last 20 years from rough laminated paper signs pinned on trees and plastic signs on improvised poles to some quite professional signposting now. What has brought things forward is a partnership formed a couple of years ago between the nearby Marble Arch Caves Global Geopark to make their tourism facility cross border with Fermanagh, with Cavan County Council who wish to expand The Burren's Potential as a better tourist amenity and interest, and with Coillte to handle the forest management. Coming up soon here appears to be more car parking, more picnic tables, drinking water access and a public toilets. 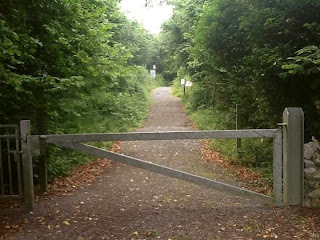 At present car parking is limited for health and safety reasons due to the clear felling, but it appears that re-planting with be a mix of broadleaved and conifer trees and then management will be of the Prosilva type so there will never be clearfelling here again in the future. Once felling is completed it looks like there will be public access to the forest roads again. Better signage along the tracks would be nice. It once was there with colour coded arrows so folks who get the excellent walking guide from the Blacklion Visitor's Centre could follow the trails. Some forests I tend to feel should be for peace, calm and bathing, some forests are great for playing in and some forests so precious that few should perhaps know about them ... but this Cavan Burren forest seems to deserve all of the visitors it can get to explore what is here with its megaliths, plants, ferns, mosses, stories and eventual mixed native woodland plantations.